In my short two and a half week stay in Sabie, I’ve had some wonderful conversations with many African gogos (‘grandmothers’) as I delivered 26 letters from Vernon granny-partners. Grannies à Gogo: the Vernon – South Africa Connection wants to learn more about their personal circumstances, and I have been privileged to be let into their lives and homes. 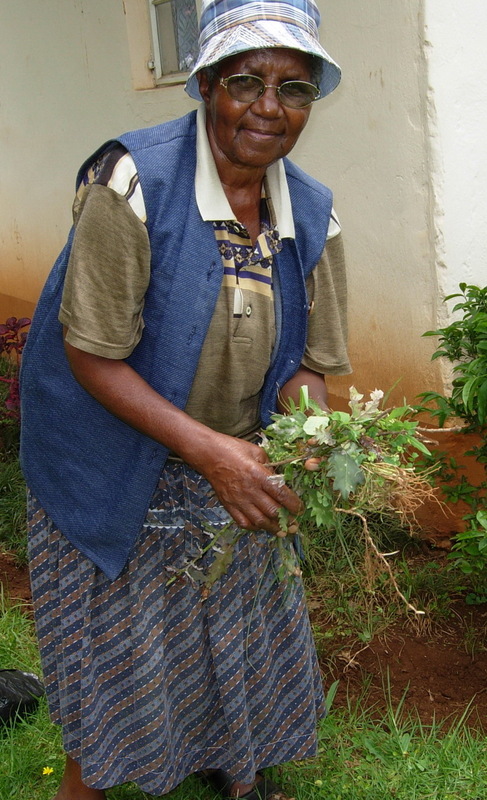 Gogos and gardens are flourishing as Emma Skosana weeds her churchyard, as well as the Sitabogogo veggie gardens. Emma has a glass eye, the result of a car accident many years ago but she is not one to indulge in her infirmities. Recently, despite her one eye and obvious trembling, she’s taken up knitting. She is also a regular in the gogos’ vegetable gardens, plucking at weeds and wielding a watering can. In the midst of the garden she raises her voice in an African song, and the other women sing the response. She is clearly a respected elder among them who has known suffering, but is flourishing nevertheless, just like the garden. My heart sings, too, to see so much progress since my last visit nine months ago. (See archived accounts of that visit at: https://granniesagogo.com/contact-us/personal/ ). Where I saw only one fully producing garden previously, they now have five times that amount. Funds from Vernon have paid for additional garden tools and, recently, a small deep freeze to ensure that any surplus produce is not wasted. I see the sewing group taking on challenging projects like English paper piecing. They have given me a number of their finished starburst patterns, each embroidered with the gogo’s name, to bring home. Members of our group will appliqué them to sewing projects which will, in turn, raise funds to be sent back to the gogos. One of the gogos is a retired nurse, and now has set up a table in the corner of Ubuntu Centre to twice a week monitor their blood pressure and blood sugar, and makes referrals to the hospital when needed. Sitabogogo has come together as a solid group, where previously they were isolated in their own small spaces with big worries. · They learn and share together: new sewing, gardening, and baking skills, and new songs. I had great fun teaching them “This Land is Your Land” with a few alterations to include South African place names (“from Pretoria, to Robben Island . . .”). Within 20 minutes they were singing it with gusto. · They comfort each other: hospital visits to sick members, and home visits to pray with bereaved gogos. Their diverse beliefs sustain them in their adversity. · They have fun together: they practiced for and organized a soccer and netball tournament for themselves, complete with a brass band and their grandchildren as cheerleaders. Next they are planning a fashion show using their new sewing skills and donated fabric. · They’ve had various guest speakers educating them in the care of HIV+ grandchildren, on voter registration, on money management, to name a few. While I was there they had a session on women and children’s rights against abuse, and I attended a World AIDS Day rally with them on Dec.1st. 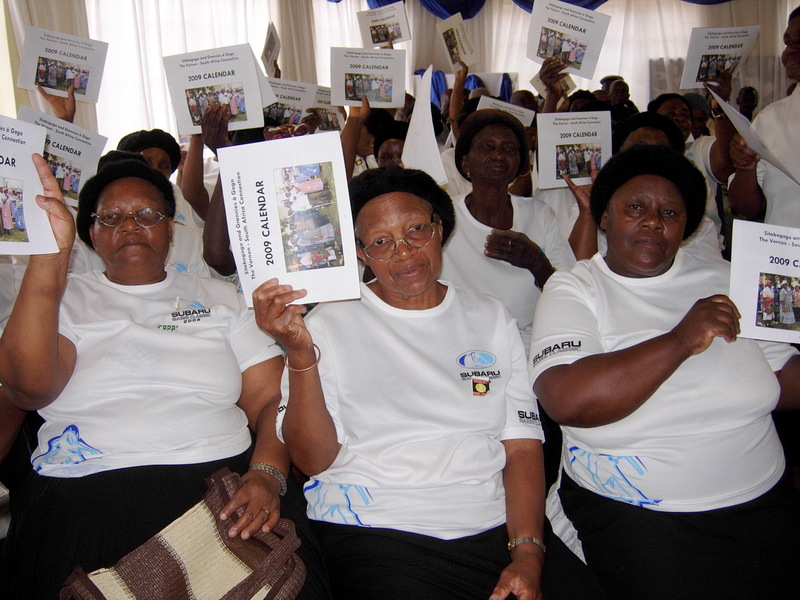 Proud gogos wave the gift calendars featuring their photos. Each is signed with a greeting from a Vernon area donor. My last day coincides with their Christmas party – singing, praying, speeches, performances by the grandchildren. Today Sitabogogo also knows how to celebrate together! One hundred gogos party indoors while the children have their party outside, and an African Father Christmas does double duty handing out a gift to each as well as food parcels. The 100 calendars I distribute from Grannies à Gogo are a huge hit. The calendars are each personally signed by a Vernon area donor, and the gogos love all the photos. When they profusely thank me I make sure they understand that there are 150 members in Vernon who raise funds and love them, supported by a whole community. I depart with a Christmas wall hanging, a gift from gogo Beauty Manzini to Grannies à Gogo. It represents their expression of thanks and love, but wrapped up in it is, oh, so much more . . . their new skills, their new sense of hope in their future, their intangible improvement of quality of life. It is a magnificent gift indeed. 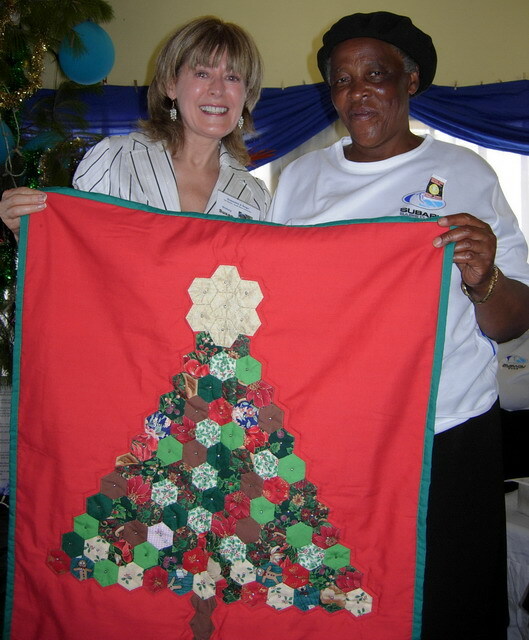 Gogo Beauty Manzini presents Susan Fenner of Grannies à Gogo with a Christmas wall hanging, made with their new sewing skills.